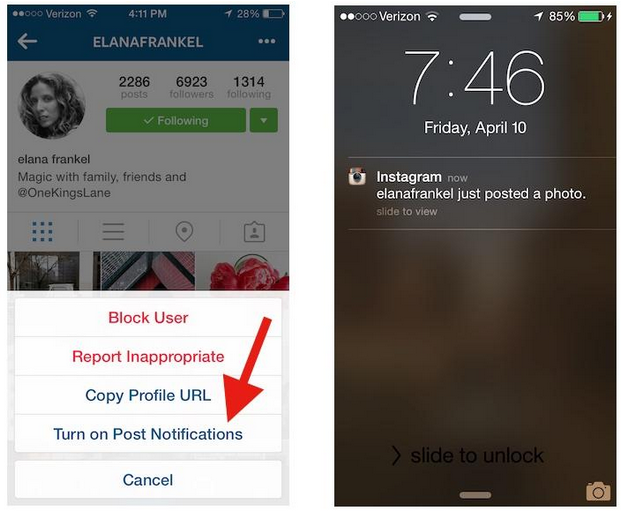 Get notified when your favorite Instagram users post photos by turning on post notifications. Post notifications, which Instagram introduced last year, allow users to subscribe to posts of the accounts they want to follow more closely. Much like Facebook’s post notifications, the feature enables you to get an alert each time an account posts. If you want to make sure you don’t miss posts from your favorite Instagrammers, you can push notifications whenever a user you like posts a photo. 1. Open his or her profile page and then tap the triple-dot button in the upper-right corner. 2. Then from the menu, tap Turn on Post Notifications. Be aware that turning on post notifications will cause you to receive push notifications each time a user posts. So be conscious of how many accounts you subscribe to and how often they post so you don’t get overloaded with notifications throughout the day.